Ben Stern and Lea Heitfeld do the things many roommates do: They cook lunch together, do the dishes, argue about keeping the house clean and the cupboards closed. But they're an unusual pair. Stern is a 95-year-old Holocaust survivor from Poland. He survived two ghettos, nine concentration camps and two death marches. Heitfeld is a 31-year-old German graduate student at UC Berkeley. But it's not just the six-decade age gap that sets these roomies apart. "My grandparents were Nazis," Heitfeld said. "They were very active. They were really into the system." But her parents felt differently. They raised her to ask questions about what responsibility non-Jewish Germans had for the Holocaust and to continue to keep this part of German history alive. "My grandparents' generation is not there anymore, so how do you keep memory alive? What is important to be preserved? How is it supposed to be remembered?" she said. "I found that very meaningful. I suddenly realized this generation, the survivors, are still around, and how can I say I have nothing to do if I can contribute something?" 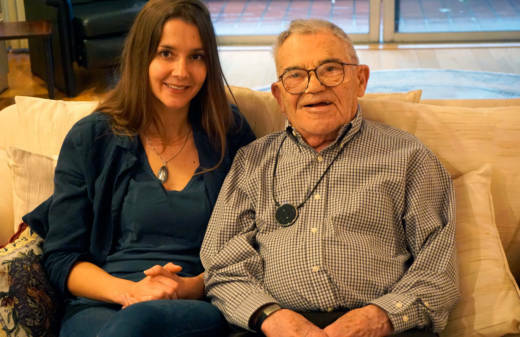 She said that's what led her to the U.S. for a graduate degree in Jewish studies, at the Graduate Theological Union in Berkeley, and to her 95-year-old housemate. "They were looking for a live-in companion for Ben," Heitfeld said, "and my professor wrote me that Ben is the coolest, funniest, most handsome old dude I know." After Stern's wife moved into an assisted living facility, having Heitfeld around was a chance to not be so lonely, to share meals -- and ideas -- with someone. "I'm open-minded to get along with people," Stern said. "I want to prove it that it can be done." Even before they met, Stern felt a connection with Heitfeld. "The name Lea meant so much to me," he said. "My grandmother’s name was Lea, and I carried her on my arms from the train to the Warsaw Ghetto. She passed away in the ghetto from starvation, but she was such a dear, warm individual. The name Lea is just dear to me in my head." Heitfeld is Stern's friend, not his caretaker. The 95-year-old is amazingly active. He walks at least an hour a day on his treadmill, reads books and checks his email. Plus, he’s got his children, grandchildren and great-grandchildren nearby. "He continues to surprise us," said his daughter, Charlene Stern, "walking a mile and a half to visit my mom almost every day, insisting on doing everything he can still do and finding new ways to do it, despite blindness and deafness. He's a force for life." As Stern, Heitfeld and Charlene sit down to a lunch of pumpernickel, lox, tomatoes and cheese, Stern shares his secret to longevity. "Being positive in life. Very simple. Optimistic. Positive," he said. "Go forward. Don’t look back. I got a lot to look back, and I live with that. I live with both." "I thought you were going to tell her about your vodka," Charlene adds with a laugh. While this meal is full of laughter, Stern said mealtimes often turn serious when he and Heitfeld talk about his history. 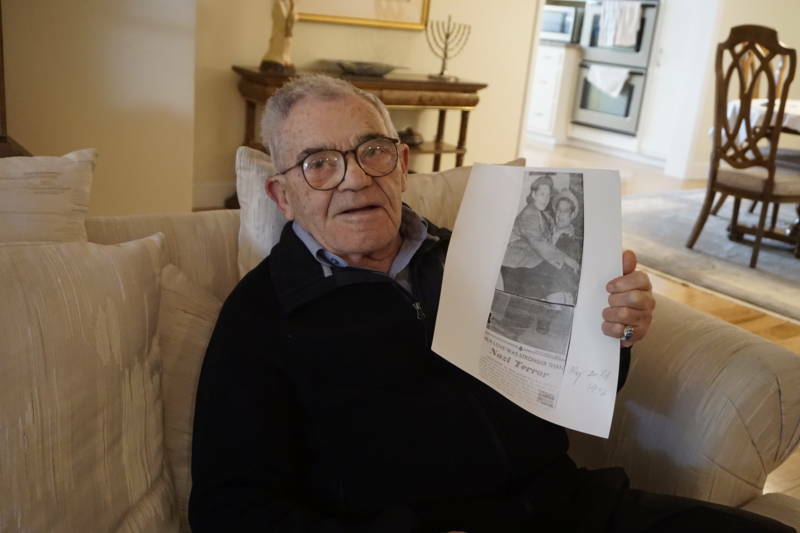 He was just 17 when the Nazis invaded Poland, turning his neighborhood into a prison for Jews. His parents and eight brothers and one sister were all killed. He survived multiple concentration camps and was one of only a tiny percentage to survive a death march from Buchenwald in 1945. "Seven thousand boys left Buchenwald on April 3," Stern said. "We walked 35 days without a piece of bread. Four boiled potatoes every afternoon. Thirty-five days, from 7,000, we were 156 who survived." Seven decades later, Heitfeld is trying to reconcile her country and family’s past by living with and sharing a life with Stern. "You find yourself on the side of the perpetrators because you know it's the history of the nation, and it's your family history, too," she said of being a German. "How can I say I wouldn't have participated if so many people participated?" This sense of what happened before in her own country has pushed Heitfeld to make sure she's not a bystander when groups are discriminated against today. "Where am I contributing? Where am I standing up? Where am I raising my voice?" she said. "As long as I'm not doing anything, I will always stay a perpetrator in a way. I will stay someone who hasn't learned from history." Charlene also wants to make sure that young people like Heitfeld learn from -- and don't repeat -- history. She has produced a new 30-minute film about her father’s life, which will be distributed primarily to schools and universities. She hopes the film will reach young people with his message of hope and resilience. "I couldn't stand the thought that as the survivors pass on, the history becomes documents by third-party people," Charlene said. "I've grown up standing next to my parents and their pain. It's very real to me. I was worried that it would become arm's length ancient history so very quickly. It became important to me, critical that his voice go out, that he tells his own story." The film shows Stern's life -- surviving Nazi doctor Joseph Mengele, being liberated by the Americans and finding his way to the United States with his new bride. She's decided to call the film "A Near Normal Man." "My father's always said he's near normal for a man who was a fugitive, was enslaved, was beaten, whipped, shot at, starved, marched almost to death twice," Charlene said. Even all these years later, Charlene is still in awe of her father. "The most astounding fact of having him for a father is where does his courage and kindness and hope come from?" she said. "I have been a witness to it every day. He continues to surprise me." The film also shows Stern's controversial stance as the leader of a movement to prevent neo-Nazis from marching in his newly adopted hometown of Skokie, Illinois, in 1978. Charlene said other Jewish-Americans didn't take the hate group seriously and told her dad to "let it pass." "My dad would not let it pass," she said. Stern collected more than 750,000 signatures opposing the march, but the neo-Nazis won the right to march with help from the ACLU. Even though it’s a controversial comparison to make, Stern said he does see an echo of Nazi Germany in what’s already happening to civil rights under President Trump's administration. "I learned a long time ago that history repeats itself," he said. "The European people were mostly indifferent to the Jewish destruction. Many of them were sympathizers. Many took active part in it." Stern said he was taken aback when President Trump did not mention Jews at all in his statement marking Holocaust Remembrance Day. "How can you ignore it and not mention the people of the Holocaust?" he said. "It’s hitting right into the heart telling you, 'I don’t care.' They don’t exist for him. And that’s what’s frightening. And that’s why we’ve got to say, 'Not here, not now.' "
He said someone who is indifferent to the suffering of others is just as guilty as an active collaborator. "That’s what I’m applying today to the youth," he said. "You cannot stand by and be indifferent. That is a sin. A colossal sin that will catch up with you later on." That's the message Charlene hopes young people will take away from "A Near Normal Man." "This film is not another Holocaust film. This is a film with the tools for the next generation for America today," she said. At 95, Stern remains defiant but also hopeful. "We as American people must say not now, not here. We need to help the people when they reach for a handout," he said. "I don't know what I’m looking for, but I'm hopeful that we as Americans continue to live and enjoy the freedom that this country offers." For more details on "A Near Normal Man," check out the website. Educators interested in using the film in their classrooms can find more information here.